There’s something about a cluttered, eclectic antique shop that takes me back to my childhood. The old books, collections of colorful teacups, and unique statement furniture pieces transport me to a simpler time. Suddenly I’m back in my childhood home baking holiday cookies with my mom. I’m taking a stroll with my grandpa to the nearest park while the trees drop leaves like soft kisses of autumn. The second I enter an antique shop my mind dances through the decades, taking pieces — and their history — from the past and repurposing them for today. I recently took a stroll down memory lane with the help of some of Minneapolis’ most unique antique and consignment shops. My first stop was Covet Consign + Design, a furniture consignment shop. 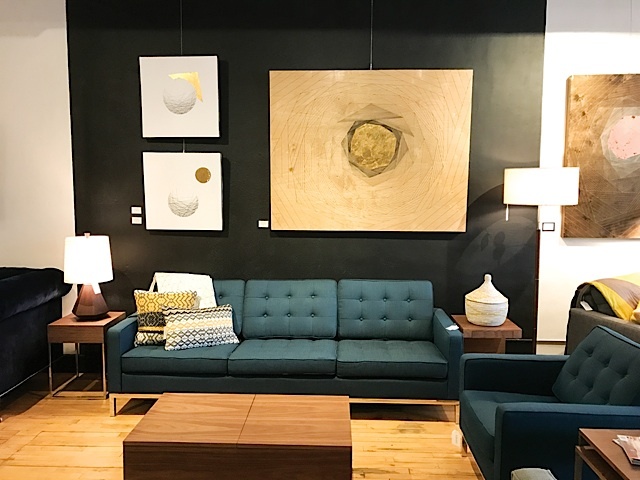 The store presents a cozy boutique appearance, but once you delve into their collection of hidden treasures, you discover a vast world of vintage furniture and colorful artwork. Covet has two storefronts, a basement, and an open warehouse stocked with historical pieces begging to make their mark on new homes. The two storefronts are covered wall-to-wall in beautiful artwork, including a series of paintings by local abstract artist Ashley Mary. Once you head downstairs, you’ll find yourself reminiscing on the past with chairs, desks, and tables straight out of the ’90s, ’70s, and even ’50s. The warehouse is a walk through history. Brightly colored chairs, patio furniture, and vintage wall decorations give the storage space a blast from the past. All of Covet’s pieces are staged strategically to display their functionality and show how different pieces could work together. For more information, visit www.covetconsignanddesign.com. My next stop was The Cottage House, a gay-owned shop with a homey feel that appealed to my nostalgic side. The sidewalk leading to the doors is lined in vibrantly colored furniture, vintage mirrors, and statement pieces that are sure to double as conversation starters. Once you enter the cozy shop, you know that you won’t be leaving any time soon. The store houses multiple rooms, each of which has its own overall theme. Several racks of jewelry and small trinkets provide endless gift options. For the book lovers, an entire wall is dedicated to books cut into letters and the outline of Minnesota — literature with sentimental value. Even the restroom is decked out in antiques! Each piece offers something different, but every piece offers the same abundance of history in a nostalgic nod toward the past. For more information, visit www.thecottagehousempls.com. In my journey to the past, I stopped at Junket: Tossed and Found, a store overflowing onto the streets with antiques. When you walk through the doors, you’ll be greeted by the owners and a table with free donuts, coffee and tea. The store nails the home-away-from-home feeling; there’s even an “anti-social shop dog” named Luna who gets carried around in a pouch by one of the owners. Frames, art supplies, crafting items, stationery, and posters will appeal to your creative side. Office supplies, stamps, kitchen utensils, and a variety of clothing lead into the next room. Every item in the store is either consigned or made in the store out of reused materials, including a selection of earrings made out of recycled bullets. For the youngsters, there’s a section of toys, children’s and baby clothes, and a free library. Junket’s basement was my favorite area of the store. The second I made my way to the bottom of the narrow staircase, I was transported to my grandparents’ basement. Surrounded by antique Hot Wheels, old Barbie dolls, and antique board games, I was no longer in a store but in the basement where I spent hours upon hours playing games with my older sister. This antique shop bleeds nostalgia, and you’ll surely find yourself losing track of time while gazing at each uniquely crafted piece. For more information, visit www.shopjunket.com. 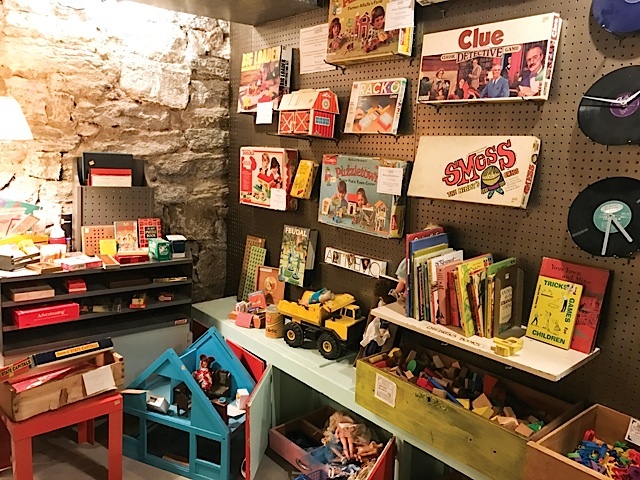 Another of Minnesota’s hidden treasures is Shop 501, the mother of a series of retailers including Jane Hall of Mustard Moon, Suzanne Thiesfeld of Objects & Art, Betty Sorensen of Petunia’s, Sara Smith of s.a.r.a., and Mary Leary of When We Were Young. Offering a variety of antiques, vintage clothing, plants, textiles, and original artwork, Shop 501 will change your idea of an antique shop. While it does house all of the typical classics of a consignment shop, this is a store where vintage meets modern. For the gardeners, Shop 501 is well-known for its plethora of garden decorations and vintage plants. For more information, visit www.shop501.com. Two of my favorite things collide at the next shop, Junk Bonanza: antiquing and travel. Junk Bonanza has locations in Minneapolis, Portland, and San Diego. Known as the “vintage market,” Junk Bonanza offers unique jewelry, accessories, home decor, and pieces perfect for gifting to that sentimental someone in your life. Not only is Junk Bonanza a store perfect for the antique lover, but it also hosts special guests, indoor events, and workshops. A long list of vendors provides a variety of styles, and if you’re interested in becoming a vendor yourself, an application is available online. For more information, visit www.junkbonanza.com. While every antique shop offers something different for each of its customers, I hope that the stores on this list will bring you the same heartwarming nostalgia that graced my busy schedule with a much-needed blast from the past. Like an old friend, these shops will make you feel like you’re at home and, more importantly, like you’re understood.